Hicks, 31, was sentenced to seven years in jail after pleading guilty to supporting terrorism, but all but nine months of the sentence was suspended. The ex-kangaroo skinner has been in the prison for five years since his capture in Afghanistan as a Taleban fighter. Australia's government has reacted coolly to news of his transfer. Under a plea bargain deal with the prosecution, Hicks could only be sentenced to a maximum of seven years. The plea deal also specifies that any term beyond nine months be suspended, the judge at the sentencing hearing on Friday evening revealed. The US must now send Hicks to his home country within 60 days - by 29 May. "We hope that it happens much quicker than that," said his defence lawyer, Col Michael Mori. The Muslim convert appeared in court on Friday in a suit and with his hair, which earlier in the week reached down to his chest, cut short. As part of the plea bargain, Hicks also withdrew claims he had been beaten by US forces after his capture in Afghanistan and that he had been sedated before learning of the charges against him. US civil rights groups have accused Washington of trying to cover up abuses and Hicks' father in Australia continued to insist his son had been maltreated. "We know for a fact that he was, and I'm going to push that issue," Terry Hicks told Australian radio. "The bottom line of all this is that at least he's back home. He's out of that hell hole." However, Australian Prime Minister John Howard accused some of trying to turn Hicks into a "hero". "Whatever may be the rhetorical responses of some and particularly the government's critics, the facts speak for themselves," he said in Sydney. "He pleaded guilty to knowingly assisting a terrorist organisation - namely, al-Qaeda." The BBC's Phil Mercer in Sydney says that while the conservative government is a supporter of the US military justice system, it has come under a great deal of pressure from Australians disturbed by Hicks' treatment. As part of his plea deal, Hicks has agreed not to speak to the media for a year, not to receive any money for his story and not to sue the US government. He is the first Guantanamo detainee convicted of any terrorist offence since they began arriving at the camp a little over five years ago. The US is gradually putting other prisoners through the same process. 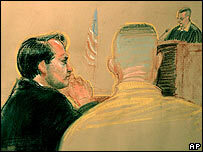 Hicks is also the first person convicted by a US war crimes court since World War II.